If you are only providing replication services for a CD-ROM (or any other physically replicated media) use the CD-ROM Replication Agreement. It is intended for use when the client is supplying the presentation to be copied onto the media and you are only providing the replication services (or outsourcing the replication to a 3rd party). This CD-ROM Replication Contract is included in editable Word format that can be customized in Word or by using the included Wizard software. THIS AGREEMENT is made this Current Day day of Current Month, Current Year by and between Company Name ("Company") and Company Name ("Customer"). This Agreement contains the entire agreement concerning the production, packaging and delivery of CD-ROMs, Compact Disks, DVD-ROMS, CD-ROM Business Cards, Packaging, Printing, Cover Art and other media and materials ("Products") from items (including, without limitation, master media, proofs, film, photographs, artwork, label data and packaging materials) delivered to Company by or for Customer ("Materials"). This Agreement supersedes any and all prior agreements or understandings, written or oral, between the parties related to the subject matter hereof. No modification of this Agreement shall be valid unless made in writing and signed by all parties hereto and may not be amended except by a written document signed by Company. This Agreement will only be accepted By signator, authorized signature or signer. Written confirmation from an authorized representative of Company, or (b) shipment of goods in accordance with the terms set forth herein. Company reserves the right to refuse to accept any purchase order for any reason. Customer agrees to be bound by all of the terms and conditions set out herein. Customer shall compensate Company, in cash, pursuant to the terms of Exhibit A attached hereto. Orders may not be cancelled by Customer after Company has begun replication, processing or manufacturing. All shipments of Products will be defined as F. ("Free on Board") as soon as Company ships the Product. Company reserves the right to make any choice of facility and shipping charges, or to switch shipping carriers without notice to Customer. Risk of loss or any damage sustained in transit shall be Customer's sole responsibility. Shipment is by regular ground service unless otherwise specified by Customer. Company reserves the right to make partial shipments. Company reserves the right to produce and charge for production overruns up to 10% over Customer's order quantity. Company will consider Customer's order complete upon shipment of 90% or more of the total quantity ordered. Invoices will be issued upon shipment of Products, excepting any delay in the shipment by Customer whereas upon an invoice will be issued upon the completion of manufacturing of the Product. Invoices for services performed by Company hereunder will be issued upon completion of those services. Customer shall be responsible for all taxes, duties, excises and other charges associated with the production, sale or transportation of Products and performance of services hereunder (other than taxes on Company's net income). Unless otherwise noted, payment of invoices is due within thirty (30) days of the invoice date. Claims for errors, omissions or adjustments in any amount due Company must be received in writing by Company within five (5) days from the date of invoice. Any outstanding monies owed to Company by Customer after the due date on the invoice shall accrue interest on a daily basis from the initial billing date at a rate of 1.5 % per month (18% per annum). Any available credit on Customer's account must be used or claimed within 12 months from the shipping date of the Products to which the credit relates. Company may require part or full payment, security or a guarantee of payment in advance of any work or services to be performed or any shipment. Company shall have a security interest in all Products and Materials until all amounts due hereunder are paid in full and reserves the right to withhold or delay shipment of any order if payment has not been made in full or has not been received on any prior order. Customer agrees to pay all costs, fees, charges and expenses of every nature (including legal fees) incurred by Company in recovering any amounts owed to it by Customer. Customer grants Company a non-transferable license to reproduce and distribute copies of all Materials to the extent necessary for Company to perform its obligations under this Agreement. All delivery times are considered to be estimates and all shipment dates are subject to change without notice unless otherwise agreed to by Company in writing. Company warrants that the Products will conform to the Specifications, or such other specifications as are agreed to in writing by Company, for a period of 30 days from the date of shipment by Company. If the Project does not conform to the Specifications, as Customer's sole remedy, Company shall be responsible to correct the Project without unreasonable delay, at the sole expense of Company and without charge to Customer, to bring the Project into conformance with the Specifications set forth in Exhibit B. This warranty shall be the exclusive warranty available to Customer. Customer waives any other warranty, express or implied. Customer acknowledges that Company does not warrant that the Project will work on all platforms. Customer acknowledges that Company is not responsible for the results obtained by Customer on the Project. Customer acknowledges that Company is not responsible for fixing problems on the CD-ROM, once mass produced after Customer has tested, proofed and approved their Project. Customer waives any claim for damages, direct or indirect, and agrees that its sole and exclusive remedy for damages (either in contract or tort) is the return of the consideration paid to Company as set forth in Exhibit A attached hereto. No action, regardless of form, arising out of any claimed breach of this Agreement or transactions under this Agreement may be brought by either party more than one (1) year after the cause of action has accrued. Customer shall retain title to all Materials and Content of such Materials provided to Company under the terms of this Agreement. Customer warrants that it rightfully owns all Materials or that it has the right and authority to reproduce the Materials and has the right to deliver all Materials to Company. Customer also warrants that it owns all copyright in the contents of the Materials (including without limitation any artwork, graphics, or computer code embedded therein) or has the unrestricted right to permit Company to perform the services requested hereunder. Customer warrants that the Materials do not contain any obscene or objectionable matter. Customer agrees to indemnify, defend and hold Company harmless from and against any and all actions, suits, claims, liabilities, damages, losses and expenses and legal fees arising directly or indirectly out of or in connection with any claim that the services rendered or Products manufactured under this Agreement violate any law, rule or regulation or violate any rights of third parties (including without limitation any liability for slander, defamation, invasion of privacy, or infringement of any patent, copyright, trademark or other proprietary right of any third party). If Customer provides artwork in any format to Company in connection with the production of disc label printing, screening or packaging of discs hereunder, any artwork must be received by Company prior to the commencement of work by Company. Customer takes sole responsibility for all delivery of Materials to Company and will be responsible for retrieving all Materials from Company hereunder. At Customer's request and sole risk, Company will store Materials as long as Company is providing services hereunder, at any place that Company deems appropriate. After a period of Days days from the date on this Agreement, a storage charge of Insert Storage Charge Fee Amount will be assessed until such time that Customer retrieves such Materials from Company. Customer is responsible for removal of all Materials within thirty (30) days of notification by Company. If Customer fails to remove Materials, as requested, Company shall have the right to: (i) return the Materials, at Customer's sole expense, to Customer at the address indicated on the last order placed by Customer, or (ii) erase, destroy, or otherwise dispose of such Materials as Company sees fit without liability to Customer or any other person. Company shall retain ownership to all production materials and tooling associated with the Product (including masters, glass masters, film, proofs, blueline or other artwork, prepress materials, stampers, and other tooling) produced by Company. Company shall also retain all rights to all methods, practices, sketches, specifications and computer programs used required for the performance of this Agreement excepting specifications or data that were developed by Company specifically for Customer's use. Customer agrees not to export any Product in violation of any export control laws, rules or regulations. The Products shall remain the property of Company until shipment. Products held by Company at Customer's request shall be held at Customer's sole risk and responsibility. If Customer discloses confidential information to Company and clearly identifies such information in writing as "confidential", Company shall use reasonable care to ensure that such information is disclosed only to Company's employees or contractors requiring access to such information to render the services or manufacture Products requested by Customer. Nothing herein shall limit Company's right to use or disclose information that (a) becomes available to the public without fault of Company, (b) is lawfully acquired by Company from a third party, (c) is in the possession of Company at the time of disclosure by Customer, or (d) is developed by or on behalf of Company by persons who have not received Customer's confidential information. Company will not be responsible for failure to fulfill its obligations under this Agreement if such failure is caused by circumstances beyond the reasonable control of Company or its suppliers or contractors (including, but not limited to, acts of God, availability of materials, equipment failures, strikes or other labor disturbances). A final proof will be provided to Customer prior to mass production or replication and/or release of any Digital Media and identified to Customer as such. Customer assumes full responsibility to make sure that the final proof is correct in all capacities, including, but not limited to: grammar, spelling, information, content, artwork, copyright and functionality. Company shall not be held responsible for errors and omissions. 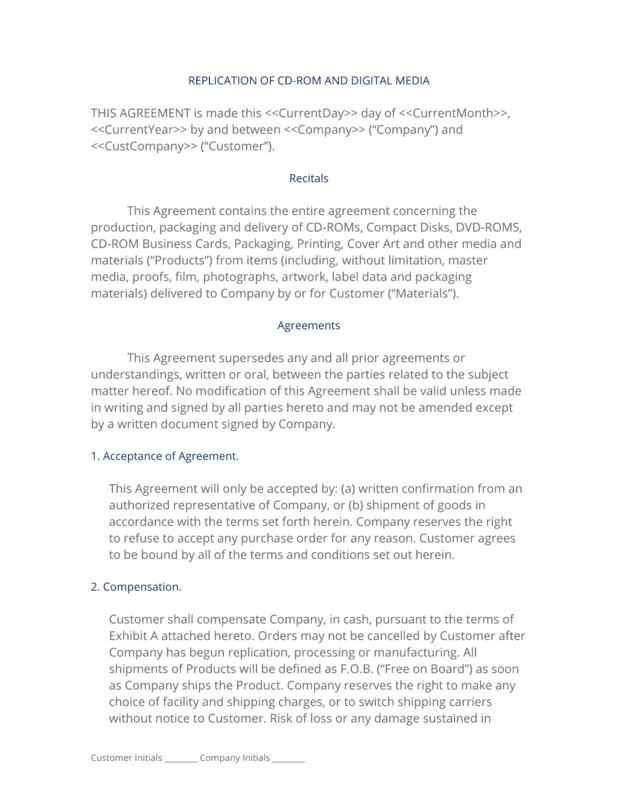 The complete CD-ROM Replication Contract - with the actual formatting and layout - is available in this Contract Pack.